This black and white photo taken by Guy Kendall at Cold Spring Park, Rochester, N.H. This image is the first significant, side-by-side, finish-line action photo captured in the Kendall albums. Roan gelding, Blue Jay appears in the lead. 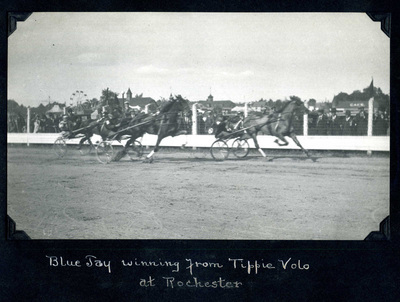 Bay mare, Tippie Volo appears in second. According to Kendall's handwritten notes in the race card indicate the third place horse is Hollyrood Jessie by Belwin and Hollyrood Janet. The background includes a shot of the crowd of men wearing topcoats and hats. Almost directly across from Kendall's position, it is possible to see another photographer with a box camera. In the distance it is possible to see the ferris wheel and fair ground cafe.